Who was Stewart, and whats she got to do with Stafford County's Hartwood Days Festival? 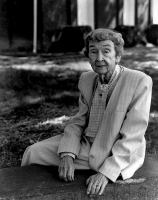 Stewart Jones, a member of Hartwood Presbeyterian Church (owning the Festival grounds upon which Hartwood Days is held), dedicated her life to educating those future generations who came in contact with her. Whether through formal institutional training, or in the classroom of life, she endeavored to make sure that young and old understood. Understood what had happened, and where it happened. Understood a sense of community. Understood why it is important to know these things. For that reason, it is fitting that Hartwood Days, held just across the street from her historic house, hold true to that spirit of education, that "sparkle in her eye" that came when someone 'got it'. Its also important that it be a fun event, as anyone who knew Stewart, knew that she was a happy person! Venturing Crew 1717 hopes that you enjoy Hartwood Days, and we hope you learn something new. Read on for more information about this amazing little woman, who was only little in height, for she was a giant in spirit. H. Stewart Jones (the H. stood for Helen but she never answered to that; "call me Stewart," she would say) was born in Stafford and lived and died in a large, white house on Hartwood Church Road, herself a living history. She devoted her life to education, and to keeping historic bits of Stafford from being knocked down. .Jones died April 7 at the age of 94 and was buried, with 14 other kin, beside her church, Hartwood Presbyterian, across the road from her home. She never married and had no close survivors, except for Mary Combs, her companion and caregiver. Her legacy comprised buildings and open land and cemeteries that enrich the county's future with its past. Jones carried a mantle given by the Stafford County Historical Society to only 14 county residents, that of Keeper of the Knowledge. In 1989 developers and a quarry company had their eye on some 2,000 acres south of U.S. 17. "It was full of wildlife and abandoned gold mines," recalled Ruth Carlone, an early Jones ally now a planning commissioner. "Stewart's mother owned property in the area. At Stewart's suggestion, we formed Citizens to Serve Stafford." H. Stewart Jones was a lifelong educator who fought to preserve Stafford history. In 1993 the county planned to build an elementary school in Hartwood. "A little red barn was on the site," Carlone said, "and Stewart was going to save it." The nearly 90-year-old structure, about 20- by 30-feet with two stories and a hipped roof, had no place to go until Jones provided a site for it on her property across the road. She paid to move it, and it remains there today. H. Stewart Jones protected her property by making it a conservation easement with the Virginia Outdoors Foundation. At Christmas, children's parties ("Stewart loved history and she loved children," Carlone said) are held there. There was the occasional loss. That same year, a "little blue house," on U.S. 1, north of the county administration building, was in the way of a developer's plan. The building dated to the late 1800s. "Stewart got Ray Hodge's Garage [now located at Eskimo Hill] to move it," Carlone said. "But we couldn't find a permanent home for it, and it eventually was hauled off to the landfill." It wasn't just buildings. "In 1990 a cemetery dating from 1776 was discovered in the heavy brush off Shackelford Well Road, behind the future site of the Hartwood Elementary," Carlone said. "Stewart suggested we clean it up." A "suggestion" from Jones was tantamount to a command. "She was like a little bird," Carlone recalled of her friend, who stood just 5 feet tall, "but she was set in her ways." With help from some Boy Scouts, they cleaned up the more than half-acre site in five months. The plaque by the road refers to the site not only as the Hartwood Meeting House Cemetery but also a "Civil War Federal Camp, 1862/1863." However, only "Old School Baptist" parishioners and their servants are known to be buried there. Meanwhile, Jones was instrumental in having the state erect one of its silver-and-black historical landmark road signs in front of Hartwood Presbyterian. Her property also became protected. In front of her fence is a sign, put up by the Virginia Outdoors Foundation, that reads, "This property is forever protected by a conservation easement." Jones had a plan in mind--to have a triangle of Hartwood just off Route 17 declared a historic district. Five specific buildings would be included: Jones's home at 35 Hartwood Church Road; Hartwood Presbyterian Church, built in 1857-59; the community's original post office building, now a private home; the little red barn, symbolizing the area's rural roots; and the Meeting House Cemetery. "She wanted a historic district," Carlone said, "and that's what she's going to get. We're also going to plant a tree in her honor in front of Hartwood Elementary." That gesture also will reconnect her love for history with her commitment to education. Formally, she is known as "Dr. Jones." She earned her doctorate from American University in 1950. Her doctoral thesis, 400 pages long, was titled "A Historical Study of Public Education in Stafford County from 1865 to 1965." Hartwood Presbyterian Church dedicated a Civil War Trails plaque Sunday at 1 p.m. The sign identifies the site where a Union officer met disgrace. In November 1862, Union cavalry under the command of Capt. George Johnson, took over Hartwood Presbyterian. While occupying the church, Johnson's men removed and burned much of the woodwork. Johnson, an amateur artist, then spent much of his time drawing on the walls, so much so that he failed to heed the warnings of an impending attack. Gen. Wade Hamilton's Confederate cavalry surprised him and captured virtually his entire force. As a result of his dereliction of duty, he was dismissed from the service for "disgraceful and un-officer-like conduct." The dedication activities included a church service, cavalry and living-history demonstrations, a Civil War song fest, tours of the church and cemetery, and a lecture by a National Park Service historian. Stewart would have enjoyed it! This page last updated on 03/05/15 @ 11:06AM.